Superfoods are known for their high antioxidant content which is beneficial for health. Thus, destroy free radicals and reduce the risk of certain diseases. 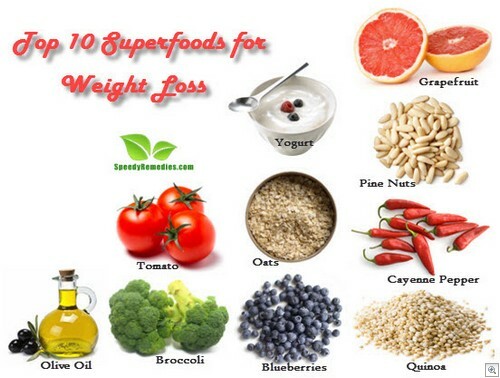 Furthermore, they are low in calories but high in nutrients and fiber. Hence, they promote weight loss as they keep you full without having to consume excess calories. These nutrient-dense yet low-calorie foods provide sufficient energy to your body. Moreover, the antioxidants help increase your metabolism, remove toxins from the body, and stimulate the body to burn calories and fat. 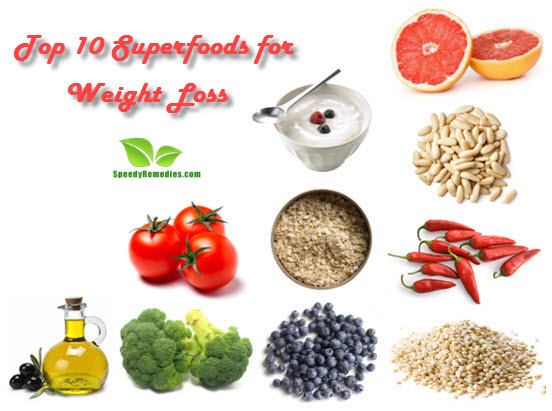 So, if you are striving to get a slimmer body naturally without compromising on health, here are 10 superfoods that are perfect for this task. Research has shown that eating half a grapefruit or drinking a serving of grapefruit juice before meals, three times in a day decreases appetite and promotes weight loss. It is believed that the chemical properties of this fruit aid in reducing insulin levels, which in turn encourages weight loss because it helps in the regulation of fat metabolism. Furthermore, being a nutritional powerhouse of vitamin C, this superfood strengthens the immune system. Grapefruits, particularly white grapefruits, are also rich in selenium which plays an important role in the metabolism and fights against free radical damage. In addition, it aids in hair growth. Blueberries are considered as the best berries for weight loss because they are high in antioxidants. In addition, the catechins found in this fruit influence certain genes that regulate the process of fat burning and storage, especially in abdominal fat cells. Hence, if you are bothered about that protruding belly, make sure you include this delicious superfood in your diet. Blueberries are also known for their cardio-protective and cognitive benefits. Plus, the phytonutrients called proanthocyanidins present in blueberries have anti-aging properties. Apart from blueberries, you can also have other berries like blackberries, raspberries, strawberries, etc. to facilitate weight loss. Low-fat plain yogurt serves as an excellent superfood to help you shed pounds. Like other dairy products, it contains protein, calcium, iron, and other nutrients. Another benefit of protein is that it makes you feel fuller for longer and hence, helps reduce food cravings and mindless eating. Besides, Greek yogurt contains more protein than plain, low-fat yogurt. Moreover, it is a woman’s best friend because a serving of Greek yogurt provides almost one-fourth of a woman’s daily calcium requirements. Thus, make sure you incorporate this superfood in your regular diet. Moreover, you can enjoy delicious yogurt smoothies and use it as a substitute for mayonnaise or sour cream. Oats are highly absorbent and are rich in fiber. Hence, they create a feeling of fullness, thereby killing your hunger pangs. It creates a gummy layer in the intestines, which reduces the rate of carbohydrate absorption and stabilizes blood sugar levels. In addition, oatmeal promotes digestion, lowers cholesterol (especially bad cholesterol), reduces hypertension possibilities, and provides a lot of energy. So, you can start your day with a bowl of healthy oatmeal, preferably mixed with fruits and nuts. Moreover, you can create a savory recipe using oatmeal, flaky sea salt, olive oil, freshly ground black pepper, and aged sharp cheddar cheese. Your weight-loss diet is likely to be incomplete if you do not include olive oil in it. Olive oil is loaded with antioxidants and oleic acid (a monosaturated fat) which is considered healthy. It increases your feeling of satiety after you have a meal. Furthermore, it lowers cholesterol levels and hence, reduces the risk of heart disease. Thus, you can extra-virgin olive oil in your salad dressings and bread dips. Besides, you can sauté healthy veggies in this oil. Though olive oil is healthy and suppresses hunger, you still need to have it in moderation. Owing to its low calorific value and high fiber content, tomato is considered as natural weight loss food. It is packed with antioxidant. To derive maximum benefit, it is suggested to consume tomatoes with their seeds and peels because they contain fiber. Because of the fiber, tomatoes help curb overeating. Moreover, it is believed that tomatoes tend to alter the levels of hormones that regulate appetite. In addition, they are rich in lycopene, an antioxidant that plays a crucial role in decreasing the risk of cancer. Cayenne pepper and other hot peppers like Jalapeno, Serrano, Tabasco, Habanero chili, Thai pepper, and so on are highly beneficial for weight loss. Cayenne pepper, in particular, aids in losing excess weight by producing heat in the body boosting the calorie burning activity. It has an active ingredient called capsaicin that increases your metabolism, curbs appetite, and helps burn fat. Moreover, it clears congestions, strengthens the immunity, regulates blood sugar levels, prevents ulcers, protects the heart, and acts as a natural blood thinner. So, consider adding spicy cayenne pepper powder in your soups, stews, and favorite recipes. Furthermore, you can have cayenne pepper tea prepared by adding a teaspoon of cayenne pepper, two tablespoons of lemon juice, two tablespoons of maple syrup, and some ginger. Apart from reducing weight, it detoxifies the body, soothes ulcers, and fights off colds. If you cannot have spicy food then you may take cayenne powder capsules, twice daily. Pine nuts are packed with protein and monosaturated fats that eliminate triglycerides and protect against heart disease. In addition, the fatty acids present in these tiny yet tasty nuts suppress your appetite and help you feel fuller. This healthy food also contains vitamin B1, vitamin B2, vitamin B3, vitamin E, beta carotene, iron, magnesium, and zinc. Apart from promoting satiety and cardiovascular health, pine nuts aid in digestion, relieve gastrointestinal problems, and control autoimmune and inflammatory diseases. Broccoli and other cruciferous vegetables such as cabbage, kale, cauliflower, Brussels sprouts, Swiss chard, etc. lower your risk of obesity because they are loaded with folate. In addition, high folate levels also help your lose more weight during dieting. It is a B vitamin that works with vitamin B12 and vitamin C to regulate insulin levels and metabolize proteins. Furthermore, folic acid increases the body’s metabolism rate, slows down the fat accumulation process by breaking down fats into fatty acids and glycerol to provide energy. Plus, being rich in vitamin C, calcium, beta carotene, fiber, and so on, broccoli is good for your overall health and well being as it reduces the risk of developing numerous diseases like cancers, heart disease, cataract, high blood pressure, etc. Quinoa is an excellent source of dietary fiber, protein, and complex carbohydrates. In fact, the amount of protein found in quinoa is equal to the amount of protein in milk which is considered as one of the best sources of protein. So, quinoa helps to stay full for a longer time. Being a complete protein food, it contains sufficient proportions of all the amino acids required by the body for normal biological functioning. Plus, this grain food is rich in healthy fats, fiber, iron, and calcium but low in calories. Moreover, it contains trace minerals like manganese and copper that reduce bone loss. It is similar to rice in terms of size and texture. You can incorporate this superfood in a variety of sweet and savory recipes. In addition, you can cook and then blend quinoa seeds and use the resultant paste as a thickening agent. Being low in glycemic index, quinoa is beneficial for diabetics as well. Plus, those who need to take a gluten-free diet, too, can opt for quinoa as it does not contain gluten.